You have a passion for stones, for Real Estate and you are creative, dynamic, charismatic with an innate sense of human relations and negotiation? Moreover, you perfectly know your geographic region , and have a local network... you are the person we are looking for, to make the link between supply and demand of a real estate market standing before you. We value each person of our team, as well as the skills, and recognize the contribution and attention to the market. Our commitment? We give to our employees, the opportunity to increase their knowledge, their skills, and we highly contribute to their professional development. Joining us means having the opportunity to build their knowledge, their skills, in a motivating and dynamic work environment, while having the ability to take responsibilities and move up the hierarchical levels of a successful team. 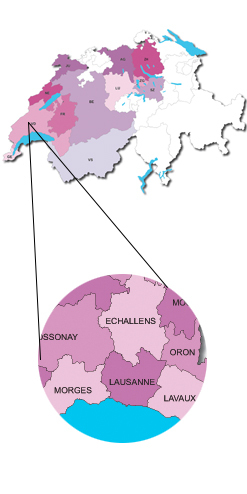 Established in French-speaking cantons where grow continuously, we are, since the first quarter of 2014, also present in German-speaking Switzerland. Indeed, we want to unify all the qualities we have in switzerland in order to offer the best to our customers, and share the great diversity of culture and real estate knowledge of our team members.